A new-build 37 metre motor yacht has been jointly listed for sale by Jeremy Comport at Ocean Independence and John Jacobi at Merle Wood & Associates. Known as Project 3707, this yacht for sale is currently under construction in GRP at the French yard Couach as the seventh hull in its 3700 series with delivery due in Spring 2019. Designed in-house and being built on speculation, Project 3707 features a five-cabin layout, giving accommodation for up to ten guests as well as five crewmembers in three further cabins. This decision was taken to ensure she has the maximum potential for both chartering and private use, according to the builder. There is still time for a new owner to come in and put their stamp on the yacht, with several interior design and fit-out choices yet to be made. Preliminary sketches suggest a sober and neutral interior décor, but this is very much up for discussion. Power will come from a pair of MTU M90 diesel engines that will allow for a cruising speed of 24 knots, topping out at 28 knots. Meanwhile, the superyacht garage will be large enough to house a Jet Ski and a five metre tender. 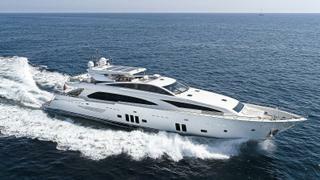 Available to view at the yard, the Couach 3707 is asking €10,000,000.